Saul 'Canelo' Alvarez became a three-weight world champion by outclassing and outmuscling Rocky Fielding via a third-round knockout. Alvarez ripped the WBA 'regular' super-middleweight belt from Fielding in a destructive TKO at Madison Square Garden on Saturday. 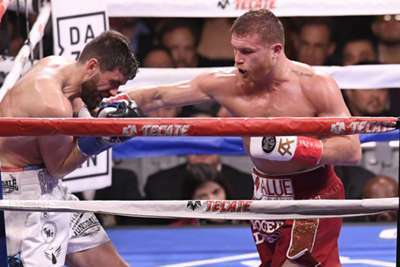 Mexican superstar Alvarez (51-1-2) was coming off his 50th career victory – a blockbuster bout against Gennady Golovkin at middleweight in September – and the big-hitting fighter continued where he left off. The likes of tennis great John McEnroe and Hollywood actor Bruce Willis were in attendance in New York, where Alvarez flexed his muscles from the outset. Fielding was a towering presence inside the ring but the Englishman was out of his league – forced to his knees in the opening round after taking a strong left shot to the body. Alvarez piled on the pressure, with his left hand to the head and body doing the damage. Fielding went down again in the second round. Another body shot doing the damage as Alvarez dominated. It was more of the same in the third round, with Alvarez knocking Fielding down twice to force the stoppage in a brutal and merciless display of boxing.